Engineers looking for a material strong enough to support the tremendous forces exerted by a space elevator will want to pay attention to this remarkable new breakthrough. Researchers have weaved microscopically small diamonds into ultra-thin nanothreads. 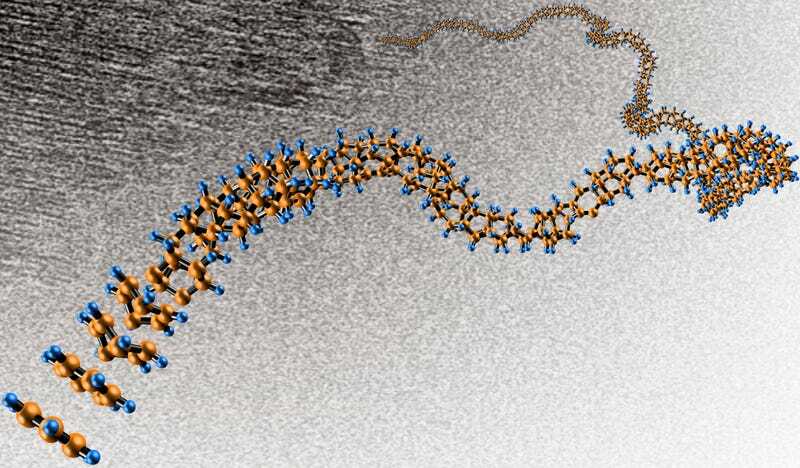 Remarkably, the never-before-seen structure appears to be stronger and stiffer than today's nanotubes. The breakthrough was made by John Badding and his team at Penn State University, the results of which now appear at Nature Materials. At the heart of the nanothreads are a long, thin strand of carbon atoms that are arranged like the fundamental unit of a diamond's structure — zig-zag "cychlohexane" rings of six carbon atoms bound together, in which each carbon is surrounded by others in the strong triangular-pyramid shape of a tetrahedron. This is the first team to coax molecules containing carbon atoms to form the strong tetrahedron shape and then link them together end-to-end to form a long, thin nanothread. The structure may also be the first member of a new class of diamond-like nanomaterials based on a strong tetrahedral core. "It is as if an incredible jeweler has strung together the smallest possible diamonds into a long miniature necklace," Badding said in a press release. "Because this thread is diamond at heart, we expect that it will prove to be extraordinarily stiff, extraordinarily strong, and extraordinarily useful." The team's discovery comes after nearly a century of failed attempts by other labs to compress separate carbon-containing molecules like liquid benzene into an ordered, diamondlike nanomaterial. "We used the large high-pressure Paris-Edinburgh device at Oak Ridge National Laboratory to compress a 6-millimeter-wide amount of benzene — a gigantic amount compared with previous experiments," said Malcolm Guthrie of the Carnegie Institution for Science, a coauthor of the research paper. "We discovered that slowly releasing the pressure after sufficient compression at normal room temperature gave the carbon atoms the time they needed to react with each other and to link up in a highly ordered chain of single-file carbon tetrahedrons, forming these diamond-core nanothreads." protect the atmosphere, including lighter, more fuel-efficient, and therefore less-polluting vehicles. "One of our wildest dreams for the nanomaterials we are developing is that they could be used to make the super-strong, lightweight cables that would make possible the construction of a "space elevator" which so far has existed only as a science-fiction idea," Badding said. Read the entire study at Nature Materials: "Benzene-derived carbon nanothreads".